Conventional management approaches cannot meet the challenges faced by ocean and coastal ecosystems today. Consequently, national and international bodies have called for a shift toward more comprehensive ecosystem-based marine management. Synthesizing a vast amount of current knowledge, Ecosystem-Based Management for the Oceans is a comprehensive guide to utilizing this promising new approach. At its core, ecosystem-based management (EBM) is about acknowledging connections. Instead of focusing on the impacts of single activities on the delivery of individual ecosystem services, EBM focuses on the array of services that we receive from marine systems, the interactive and cumulative effects of multiple human activities on these coupled ecological and social systems, and the importance of working towards common goals across sectors. Ecosystem-Based Management for the Oceans provides a conceptual framework for students and professionals who want to understand and utilize this powerful approach. And it employs case studies that draw on the experiences of EBM practitioners to demonstrate how EBM principles can be applied to real-world problems. The book emphasizes the importance of understanding the factors that contribute to social and ecological resilience —the extent to which a system can maintain its structure, function, and identity in the face of disturbance. Utilizing the resilience framework, professionals can better predict how systems will respond to a variety of disturbances, as well as to a range of management alternatives. Ecosystem-Based Management for the Oceans presents the latest science of resilience, while it provides tools for the design and implementation of responsive EBM solutions. "This excellent book demystifies the idea of ecosystem-based management and explains the many ways in which the ideas can be applied in the real world. At once a primer, theoretical synthesis, practical guide, and roadmap for the future, this book will is a must-read for all those interested in the subject." "This unique volume provides case studies and worked examples of marine EBM—a guidebook on implementation." 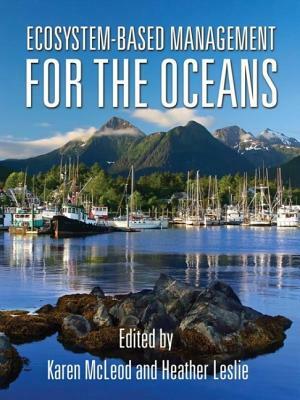 "This lucid and innovative book convincingly argues for a holistic, resilience-based approach to oceans management. More importantly, it charts a way forward. In a world of rapidly changing seas, it will be a critical guide for scientists, agency staff, policymakers, and students." "This important book marks a milestone in the pursuit of management that takes ecosystems seriously. Its collection of information and analysis will be of use to students, social and natural scientists, and—perhaps most important—those who would be stewards of the natural world upon which humans rely." "For proponents of ecosystem-based management,the good news is that another new book, Ecosystem-based Management for the Oceans, conveys the topic at its state-of-the-art level of development...both Marine Ecosystems and Global Change and Ecosystem-based Management for the Oceans are valuable troves that could profitably be mined, and any academic bookshelf would wear them well." "Ecosystem-Based Management for the Oceans heralds a timely call for action. Ocean scientists, resource managers, and policymakers should take careful note of the volume and connected developments. They chart a critical new course for marine management— steering us away from destruction and toward a bountiful future for Earth's oceans."